The camp is located on Big Sebago Lake's western shore...at the very end of a dead end st. It has a very private yard with plenty of parking. There are 2 marina's nearby that rent boats and jet ski's, The home has been recently totally remodeled so you'll find all the amenities you need. 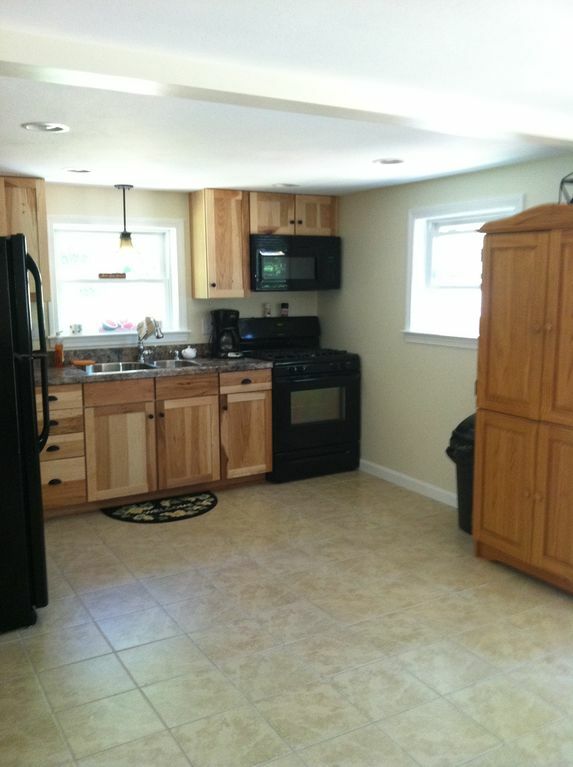 All brand new appliances, cable tv, Internet, 2 flat screens tv's, beautifully furnished. There is a four season sunroom off of the livingroom with a futon for additional sleeping, or use as a play area for kids. Upstairs has a queen bed in master, bunkbed and trundel beds in second bedroom. Outside has a large deck with separate door to sunroom. Gas grill and firepit, less than 200 yards to beautiful private shared beach perfect for kids or just relaxing. Thank you for the use of your camp, we had a great week at Sebago Lake. The location was perfect and we had plenty of room for all our visitors. We also had plenty of room for our outside games that we love to play. Enjoyed the short walk to the beach and the lake was perfect. Thank you again for the use of your camp, we had a wonderful time. What a wonderful week, even if the first half was rain/cloudy. The house is at the end of a short dead-end street and a very short walk to the beach. The camp has everything you can need for a week of relaxation: grill, firepit, outside deck, board games and plenty of room inside to lounge on those lazy days. The home description is spot-on, very clean, containing every appliance needed for a great vacation. Communication with the owner is very easy and timely. The walk to the beach is short, straight down the road and across the "main" Maine road. Sandy beach, a dock to walk out on (and jump in to the lake) and a swim platform just offshore. Many hours of sunshine - the sun rises over the far side of the lake for amazing sunrises. Other perks: There is a convenience store (Jordan's) just a few minutes walk South of the house that sells everything you might have forgotten at home. To the North of the house, one street away, is a new restaurant (Sportsman Kitchen & Keg) serving great food and drinks. A twenty-five minute drive North brings you to Naples. The neighbors were very welcoming and friendly, but keep to themselves. I would definitely recommend this beautiful home and will be back on our next visit to Sebago Lake. Lovely property comfortable short walk to beach. We had a wonderful week no issues with the property. I even met and enjoyed several of the neighbors. The camp was roomy and comfortable had a lot of outside seating. Thank you Cindy and Jeremy for opening your place for us. Enjoyed two weeks at beautiful Sebago, ME with all the fixings. Beautiful home with great amenities. Already booked for next year. This is our second year staying at this property and we loved it just as much, if not more. The house was spacious, clean and homey - and the beach was just a short walk at the end of the street. Lake Sebago is beautiful and clean, as was the private beach and with the White Mountains, Portland, and Freeport all under an hour drive away it's the perfect location. The girls and I hope to be back again next year! !